The positive effects of walking the labyrinth are many. 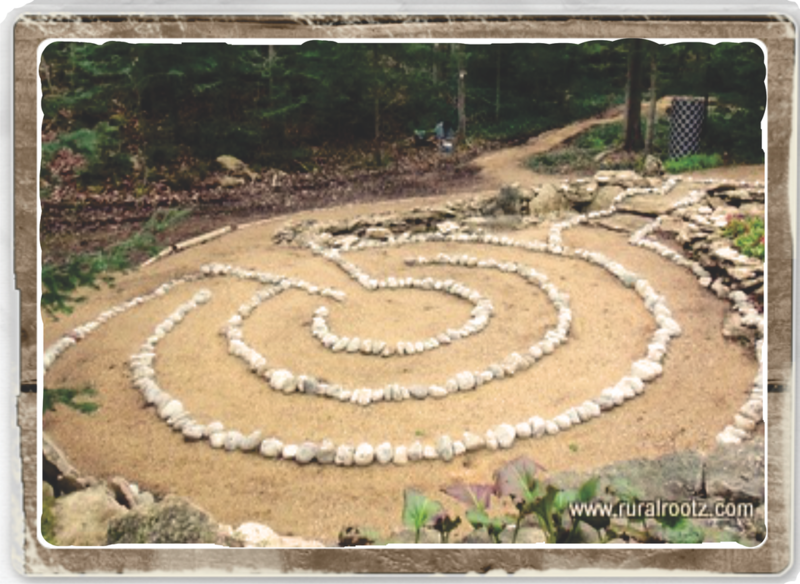 The labyrinth is a safe and healing place for quieting a restless mind. Permission is granted to the Self to "let go" allowing the intensity of mundane life to slip away. Time and space have no hold on a mind that is focused on the ever present. This is an especially wonderful way to be introduced to meditation for those who are new to the practice. All that is required is to walk and focus on your breathing while you follow the twists and turns to the center. No longer are you a “Human Doing”... you have become what you are meant to be ... a “Human Being." Our first labyrinth is a very simple design we discovered at an arboretum in Arizona. It is an Australian Aboriginal design called the Rainbow Serpent Labyrinth. It dates back about 2500 years and it is non-traditional in design. It only has three circuits and exits from the center! The Aboriginals felt that the walk to the center represented their life journey to this point in time. Since they were still alive on this earthly plane, when they exited they looked back on their life journey and gave thanks for the journey this far. It also gave them insights as to where they were going next and what course of right action they needed to take. 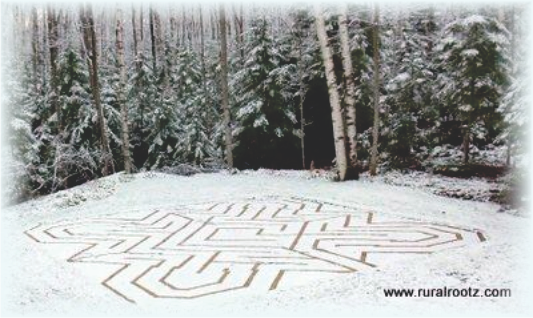 At Rural Rootz we have two labyrinths for you to experience. Both have been chosen because they are unusual designs. Our largest labyrinth is 252 feet long and patterned on the one in the Cathedral of Ely in England. We chose it because it was square rather than round. It is called the Bishop’s labyrinth in honour of a brass rubbing that we have of the Bishop of Ely, Thomas Goodryche who died in 1554. This rubbing adorns the west wall of our house and this labyrinth is to the west of the house so it seemed very fitting. The labyrinth in Ely Cathedral was designed and built around 1872, so our bishop never experienced the healing properties of walking it. Labyrinths differ from mazes in that you cannot get lost in a labyrinth. They are low and usually flat to the ground. It is a pathway leading to a sacred center and back out again. Labyrinths date back as far as 2500 years and were used in every part of the world for spiritual practices. They predate Christianity even though they were later adopted by the church. At the end of the Dark Ages, labyrinths were used as meditative tools and in Christian tradition, were set in floors of the churches. They symbolized a pilgrim’s journey to the holy land for there was no way for the peasants of the time to undertake such a journey. Since they were in the church, they also became a teaching tool. The leaded glass windows depicted the history of the bible and that became part of the journey of walking the labyrinth. These open eyed meditations led the Seeker to spiral into a Spiritual Centre. All cares and concerns for the mundane life were set aside. On the outward journey from the centre, the Seeker returned to his daily life having gained Spiritual Insights through the journey. The most famous Christian labyrinth is the one in Chartres Cathedral France, built sometime after the Great Fire of 1194 AD but before 1220 AD when the Fulbert addition to the cathedral was completed. Mazes are more like a Snakes and Ladders puzzles with dead ends, twists and turns and no direct path in or out. They are usually made of tall hedges so that you cannot see from one circuit to the next. They were a favourite in Victorian times for young couples to meet. They would arrange to go separately into the maze and ... the rest is up to your imagination!